Despite a vote to reaffirm its October position on the matter, City Council will be discussing whether or not committees and subcommittees in Ypsilanti should abide by the Michigan Open Meetings Act. Nov. 18, 2009 · 2:36 a.m.
City Council will be reconsidering whether or not the Michigan Open Meetings Act will apply to subcommittees created by itself or its boards and commissions. Toward the end of the meeting Tuesday, Councilmember Bill Nickels, D-Ward 2, motioned to reconsider the resolution, adopted by City Council last month. 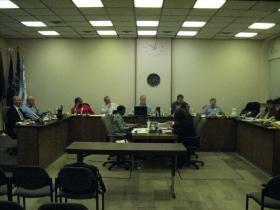 He agreed to have the matter discussed at the next City Council meeting, scheduled for Dec. 1. The motion was made by Nickels, who was one of four councilmembers to vote for the resolution last month, during the council-proposed business portion of the agenda. His motion was seconded by Mayor Pro Tem Trudy Swanson, D-Ward 1. Passed in a split decision Oct. 20, the original resolution was introduced by Councilmember Peter Murdock, D-Ward 3. It requires all committees and subcommittees created by City Council or its boards and commissions to adhere to the requirements of the OMA, a state act requiring public bodies of government to post meeting schedules, allow public attendance and make minutes available. Nickels said he changed his mind after hearing a presentation from City Attorney John Barr about the OMA earlier in the meeting. He said the presentation changed his opinion, and City Council’s passing the resolution had “unintended consequences” on the people who serve on city boards and commissions. During his presentation, Barr said if a committee or subcommittee is created by a public body with less than a quorum of members from that body, then the committee or subcommittee does not generally have to abide by the OMA. He said this is especially true when the groups are advisory in nature, and only exist to give recommendations to a public body for a decision. Murdock brought up a 2003 Michigan Court of Appeals case, titled Morrison v. City of East Lansing, where it was decided that a group created by a public body is required to meet the requirements of the OMA no matter how many members of that body sit on the committee or subcommittee because the public body is granting the group some of its power and governing authority merely by creating the committee. Barr responded that the law may be applied to some groups, depending on the facts of the case, and it is best for a public body to error on the side of caution and make meetings as open as possible. When motioning to reconsider last month’s vote, Nickels said the resolution could create a burden for city staff and the community members that make up those committees, as much work is required to post meeting schedules and take minutes. He said there may not be enough meeting places in the city that could accommodate audience members’ participation in a meeting if they are forced to be made public. Three members of the community spoke on the issue during the audience participation portion of the meeting’s agenda Tuesday. All spoke out against the resolution adopted by City Council last month. This portion of the agenda followed Barr’s presentation and preceded Nickels’ motion. During this portion of the meeting, Rod Johnson, chair of the Ypsilanti Planning Commission, asked “Do we not have the backing of the Council? These were some of the “unintended consequences” Nickels spoke of. Mayor Paul Schreiber agreed with the argument. He said the city relies on volunteers in these boards and commissions to do help run the city. “When you have people that are amateur volunteers, it really places a burden on them,” Schreiber said. He said while the OMA is not meant to be inconvenient, but it is good policy to adhere to the law. Murdock said the Downtown Development Authority had four standing committees, which posted meetings that were open to the public and took minutes. He said the Planning Commission used to have a requirement in its bylaws that required its committees to adhere to the law. However, that was revoked in during the summer. He said the two organizations’ non-adherence to the law would be a direct violation of the OMA. Barr pointed out that unless Council chose not to, it should reconsider the resolution at its next meeting. Nickels said he had intended to vote on the matter at the meeting, but would be willing to put it off until December. Murdock then motioned to re-affirm the resolution passed in October. He said he wanted to vote on the matter at that meeting. Councilmember Brian Robb, D-Ward 3, seconded. After some discussion, Swanson motioned to call the question, thus ending debate on the topic. Councilmember Lois Richardson, D-Ward 1, seconded. Swanson’s motion passed, with Schreiber and Robb voting against. Swanson, Richardson, Murdock, Nickels and Councilmember Michael Bodary, D-Ward 2, voted in favor of Swanson’s motion, ending debate. Council then considered Murdock’s motion. The motion passed, with Schreiber, Nickels and Nickels voting against. Murdock, Robb, Bodary and Richardson voted to re-affirm the original October resolution. After the vote, Schreiber asked Nickels if he still wanted to discuss the matter in December. He said he did. Barr said he would do some more research in preparation for the meeting. Editor’s Note: The Citizen published an editorial last week stating its position on the matter. Readers can find the opinion here, which stated the Citizen believes any committee or subcommittee created by a public body must adhere to the law as it is stated in the OMA definition of a public body.